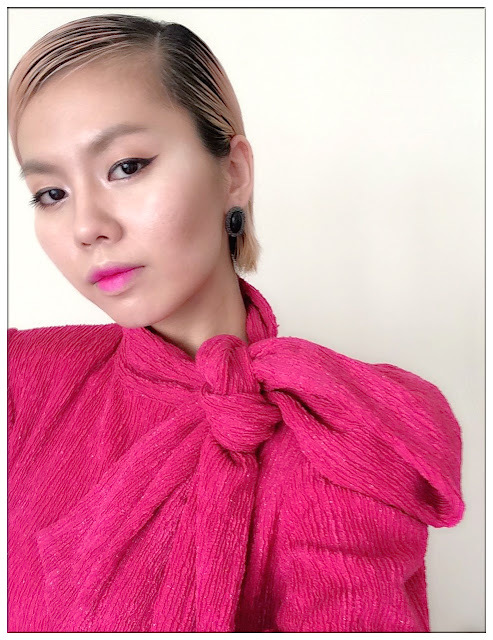 I was referred to as "That Pink Girl" in a recent event because I'm wearing a fuchsia pink dress from Melson Kuala Lumpur Fall Collection Prive 2016. Prive (Privé), which means "Private" in French fashion dictionary, is a made-to-measure fall collection of Melson Kuala Lumpur that has yet to launch. If you know me in real life, I'm that girl that absolutely have no connection or whatsoever to anything feminine. You'll see me in sneakers, t-shirts and shorts all the time (sometimes even worst!) and I feel there's nothing that I need to change. Not until recent, which I woke up and decided to go feminine. Although I'm still very casual but I'm trying to add some feminine chic elements into my styling. I guess it goes pretty well as my friends and some designers are telling me that I looked different than before, the feminine aura is there to stay. I guess at one point or another, you'll just eventually be who you will be. The bow tie and bishop sleeves details are just major love! The last few photos white balance are a bit off due to the lighting in the cafe hence you can't really see the fuchsia colour of the dress but hey, it matches perfectly with my pair of Adidas! Can't take the casual out of me! lol. It's Time to 'Make It Happen'!